What most parents have a strong belief in is that more water training the better, but we need to have a balanced approach between water training and dry land training that works within our current pool space. When we are doing dry land we need to ensure that our swimmers are wearing appropriate clothing & footwear. The Brandon Bluefins Swim Club will be continuing its association with Outperforme Athletics. They will be providing professional dry land training sessions for our Competitive groups. Swimmers need to ensure that they have their consent forms signed before participating in dry land sessions and will not be admitted until it has been done so. Additionally, swimmers are reminded that while they are at Outperforme Athletics they are representing the swim club and as such must adhere to the uniform policy and code of conduct. Dry land training is a vital component of a successful swim program. Increased upper and lower body strength, core stability and endurance, carry over to improved swimming, recognized by faster times. 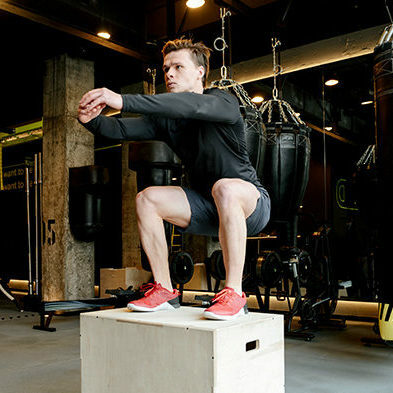 While sport specific work is the best way to “get better”, adding dry land training, flexibility exercises, plyometric work, and resistance training athletes will make additional gains. Core strength is crucial for helping make your body move more efficiently through the water. Strengthening the muscles of your abdomen and lower back allows for smoother, more effective strokes and kicks. The program used is a basic plan to increase muscle strength, flexibility and cardio conditioning. It will not develop “Big Muscles”, but will develop stronger muscles. Close attention is paid to PRE HAB exercises, designed to help prevent shoulder injuries during training. By strengthening muscles around shoulder area minimal stress will occur.